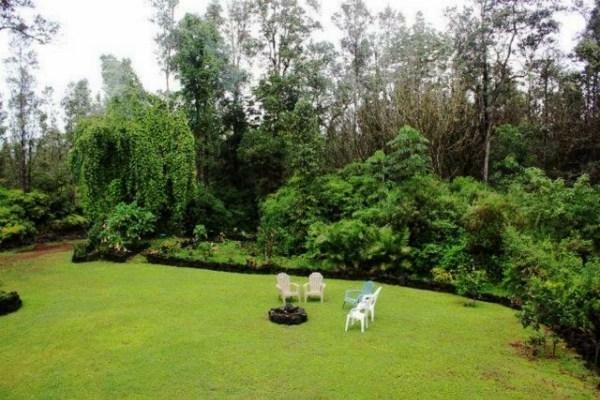 Sweet is one of the first words that come to mind when I see this lovely east Hawaii property in Hawaiian Acres. Words like charming, tranquil, and serene also come to mind when viewing this two-story 2 bed/2 bath home. 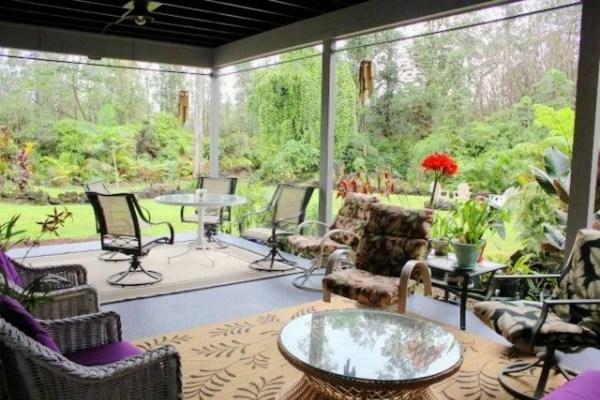 This home is beautifully landscaped with plenty of room for entertaining. An enclosed lanai on the second floor, which increases the total living space to 1,820 square feet, gives the feeling of living among the treetops. 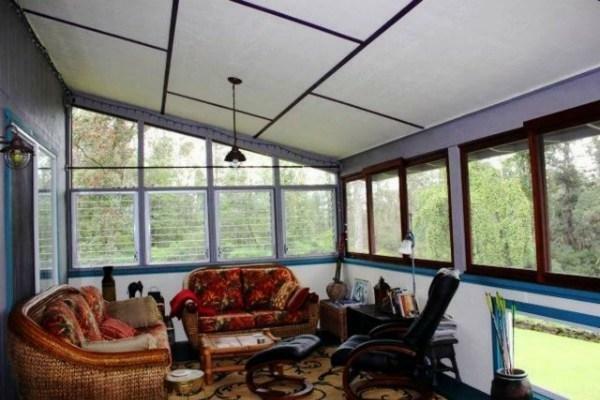 An upstairs enclosed lanai provides additional living space in this charming home. There’s also a lanai on the first floor with ample seating areas, perfect for indoor/outdoor entertaining that’s so popular here in Hawaii. The large downstairs lanai offers plenty of seating for indoor/outdoor dining and entertaining. The manicured back lawn includes a rock fire pit and lounge chairs – perfect for a relaxing evening under the stars or an afternoon barbeque. You really get the feel of a quiet retreat when relaxing in the whirlpool tub while gazing across the nicely landscaped yard with its exotic palm trees, plants, and orchids. All of which is enclosed within rock walls, enhancing the feel of privacy. Special touches abound throughout this east Hawaii property make it feel appealing. Interior finishes include 9-foot ceilings, wood trim, and tile floors while French doors and large windows give it a light and airy feel. 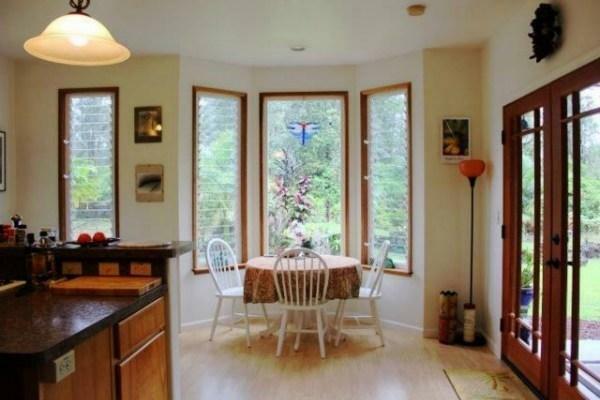 The kitchen features a breakfast nook with large windows with views of the tropical rainforest. The kitchen features a gas stove top and oven, and a dual tub sink. Glass paneled above-counter cabinets provide ample storage to display dishes or collectibles. Imagine picking fresh fruit right off the trees in the yard and eating them in the breakfast nook that overlooks the tropical landscaping. A buffet counter with bar seating provides additional seating in the kitchen. This property includes TMK 3-1-6-61-45, providing a variety of options. You can build a second home on this second TMK for rental income, or live in the existing home while you build an even larger house and then rent the existing home. Other options include using the land for agricultural purposes or keeping it as it is to enhance the feel of living in a rainforest. 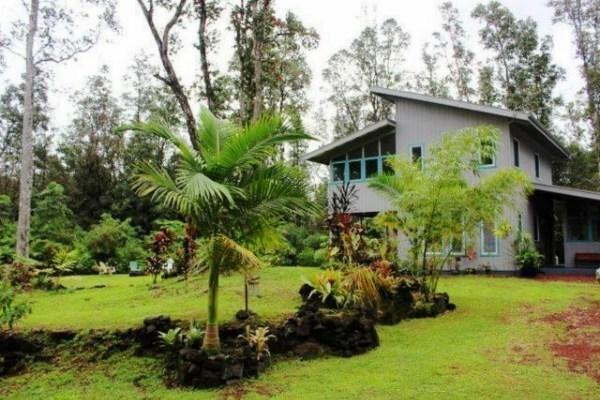 Give me a call today to learn more about this charming east Hawaii property and other Big Island homes.